The game will practically only be about surviving in an arena, while enemies spawn. Optional would be things like dashing forward or jumping back to avoid getting hit, but we want to keep it simple for now We’ll be busy enough adding our own models and textures. Have you already played your games, guys? So I guess I’m going for another Ludum Dare! Last time I made a small Twine game in the little time I had that weekend between shifts. This time, I’m going to be off all weekend! I look forward to seeing what everyone has going. I’m sure this’ll be just as fun as last time! I’ll be livetweeting my efforts on Twitter in addition to posting here. Waffles. Brain food. Food for thought. Food’s finished; time to get to work. If you look to your right, Max is already on it. Have some totally illegible scribbles (and angry rants) on graph paper! I’ll update everyone with more progress when it has been made. …I forgot to add potato. Well, I’m sure I’ll find a way to add potato down the line. “You are the enemy” is an amazing theme, but not necessarily one that is easy to do. The simple way to do it is to simply create a game where your character is the bad guy. This sort of “theme as dressing” can work if you are very good at designing a theme and a feel to go around it. But if you aren’t, it will just look boring: Packman with a goth, furious pacman? Karateca with an bloody evil karateka? A second way is to design your game around the concept of evilness. “Infectionator” of ludum dare fame, or “dungeon keeper” are two such examples. Your game becomes a bit more complex this way though. A third and harder way is to take a common game, and change it so that you control the enemies, instead of controlling the hero. Space invaders, where you actually control the invaders, or pacman where you actually control the ghosts. This can be very interesting, but like all interesting things, can be hard. The big problem is that most games are designed so that the player has many choices, and has to rely on his skill and decision making, while the enemies often rely on numbers, so making the player control the enemies in an interesting way, and making the computer controlled hero behave in a challenging way can be quite difficult. With all this in mind, the first thing that I thought for the theme was to make a “reverse-QIX”. In this reverse QIX, you control the QIX, and the computer controls the spaceship trying to fence you in. Since QIX has one enemy and one player, it makes sense to switch them around. However, making a competent AI for a QIX ship seems like a hard programming challenge. Since my initial idea for this LD was “a simple action game”, I have to think of a few more things. One thing that immediately springs to my head is a “You’re a shark and you have to eat people”. This is a great idea, but has already been done before. Another idea would be a “reverse missile command”, where you can throw missiles at a city protected by turrets. This time, the challenge would be A) making the gameplay interesting to the player, and B) balancing the turret AI (it is very easy to make a super strong AI in this game). 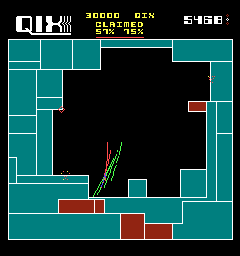 I will go cut my hair, make a decision, and begin coding… so far I’m favoring the reverse QIX game. Last 2 hours were pure paper-work to flesh out the idea and to create a schedule for creating this game. Will be a thight schedule. Should be possible to finish in compo time. My first step in planning out this Ludum Dare is to analyze what I can do right now. The goal is that in the next 50 days, I can spend time between exploiting my strengths and working on my… less than ideals. My biggest strength, IMO, is my programming ability. I’m constantly on the lookout for ways to reduce complexity in how I write my code. I’m not going to claim that I’m anywhere near where I want to be (the ideas of functional programming is something I’m pretty interested in learning, even if it just means bringing some good ideas over to my imperative code), but I believe I have enough experience in other programming pursuits to tie back into game development. One thing I’ve enjoyed doing is writing code that doesn’t necessarily work, but succinctly describes what I want the program to do. In game parlance, I’m developing code that should only care about the logic of the game. Anything about sprite rendering, entity storage, etc, should be handled by some outside, magical framework that reads my mind, bakes me cookies, and does all of that boilerplate stuff for me. Then, I build that magical framework. Minus the cookies and telepathy. It’s not much to look at, but it will do as a test case. You can view the results as I go on my bitbucket page. Right now, there are two “games” in early development (a 1942 clone, and a physics-based platformer). They both are supported by the same Python framework, ffld (“Framework for Ludum Dare”) that I write during development. I’ll go more into detail of the framework in later posts. For now though, I will say this: while the name of the framework might seem to insinuate otherwise, the goal is not to cut corners. Instead, the goal is to allow for the modularity of common code for game essentials (e.g., physics, collision, graphics rendering, asset loading, game entity tracking) , leaving only for the custom logic that will make my game unique. Of course, to keep the scope creep down, I am adding some constraints; it will only support 2D games, and be based around pygame. 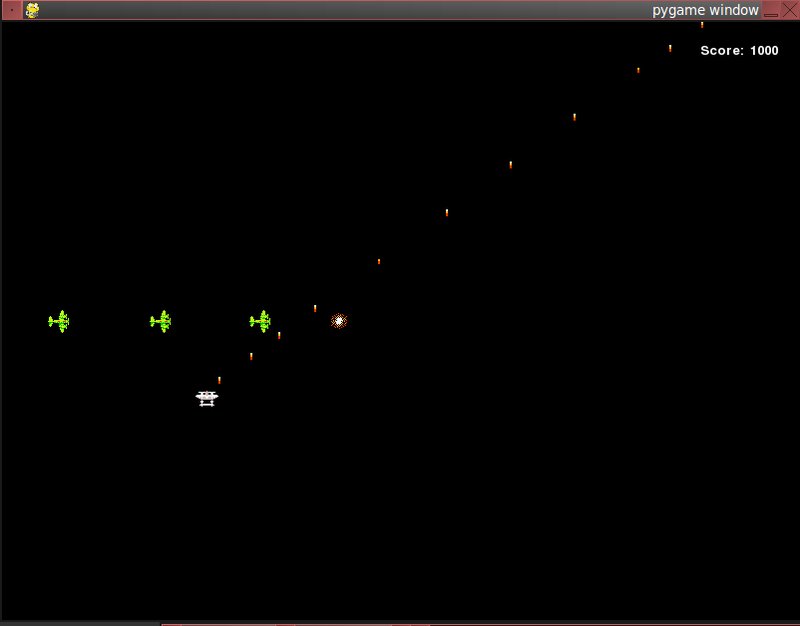 At some point later, perhaps I’ll look into expanding to OpenGL, but pygame works will for my needs currently. Hopefully, my development will be a large asset to rely upon. As far as strategy goes, this means that when coming up with a game idea, I will be better off sticking to an idea more interesting from an interaction point of view, as I have no worries with being able to throw together the strange code needed to cause it all to work right. Not by me. Not in a million years. As of today, I can’t build a grass texture to save my life. This is my biggest fear: that no matter how cool or unique of a game I can build from a game logic standpoint, the graphics will just look childish. I’m heartened by viewing some past Ludum Dare winners who eeked by on pretty cheesy graphics. I’m pretty sure one of the reasons that I never did more game development in the past was because it was so exhausting trying to find graphic assets. Sure, you could find a cool sprite sheet here and there, but not enough to make a full game. 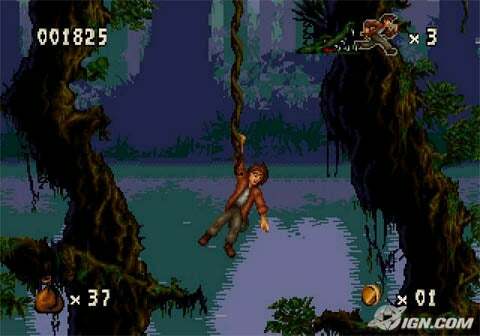 You want another sprite, similar to the one you found online, for the next level? Not with these two left hands abusing my gimp window (I guess one of my other weaknesses is taking the time to develop relationships with people who could help in this regard). And so, one of my large goals that I have tasked myself with achieving over the next 50 days is to become better at making graphics. This does not mean that I plan on becoming a turtle-necker. My goal here is not Pitfall: The Mayan Adventure. Realistically, my hope is to get into a situation where I can develop graphics that pass as… well, whatever they are supposed to look like. Maybe just one step above “programmer art”? I feel that with some work, I could probably make some grass textures that are more than just surface.fill(GREEN) if need be. I don’t have much experience generating sound, but a quick look over the various toolkits shows that it doesn’t appear to be that difficult (some of it can be randomly generated very easily with tools such as bfxr and sfxr. In the coming weeks I hope to play some more with these tools. I doubt I would want to concentrate too much on this, but I realize that music and sound will contribute to the overall atmosphere of a game in a way that could be very time-effective. Even spending a single hour making a quick song, and another for adding sound effects, could be the difference between a hack and a game. Well, considering I have a gameplan of things to do 50 days before the event, I’d like to think that this is all pretty good. At some point I like to think that I’ll do a full mapping of my time during the LD weekend (When will I sleep? How long should I spend on design? How long can I develop the game? When do I call it done and spend the rest of the time polishing? How much liberty would I allow myself to deviate from such a schedule?) I also plan on reading some more post-mortems and other tips around the LD site. Of course, I could very well go into this thinking I’ll just let my first Ludum Dare hit me like a ton of bricks and learn for the next one. I feel, however, a certain pleasure in the humility of watching my best laid plans get absolutely destroyed. While I don’t have a lot of writing experience, I do like to think that if I take my time I can be a pretty decent writer. That being said, LD isn’t about taking your time. I don’t plan on using writing to much effect since it is pretty time-consuming, but that might change if I find myself with an idea that doesn’t need a lot of code to do. Perhaps in a future LD, when I feel a little more comfortable, I will try to make a story share the spotlight of one of my games. This game is looking to perhaps be my shortest most unambitious project yet, which gives it a damn good chance of reaching polish levels far more quickly. It’s probably going to take five minutes to play, but that was true of Throwbots and it was still at least an entertaining five minutes (or so I heard, anyway). It all dwells on being trapped in a facility and depending on a very, very finite resource with an unlimited amount of things that drain this resource. Unfortunately, this resource is basically the player character’s lifeforce. And once it’s gone, that’s it. Game over. It might work, it might not. Onto prototyping the mechanics! Thanks everyone for coming out and making Ludum Dare 10 a great success. A fitting close the fifth year of of the compo. If you haven’t seen it yet, the results can be found here. Final entries can be found here. Now, as much as we’d love everyone to idle with us in #ludumdare until April, we understand this isn’t practical for everyone. So, in addition, we have a mailing list at gamecompo.com. And when in doubt, hit up ludumdare.com. Now, unlike prior years, we’ve tried to make it clear that the next compo will be in April. Anyone that’s stayed up with our shenanigans will know April is our magic month, the anniversary of the first Ludum Dare compo (the original 24 hour compo in 2002). If there’s one tradition we’ve kept over the years, it’s been holding a compo in April. Be it organized a month in advance, or pulled together last minute. Ideally, we like to plan around such things as Game Industry events (GDC, E3, Game Connection, etc), Exam season (we love you students), national holidays, or any such event that either hinders or benefits the majorities chance to participate. And in final, if you have any comments, suggestions or feedback for us, please do share them. Ludum Dare is and has always been about the community. Without you all, we’d just be an IRC channel. Thanks again everyone, and have a great 2008. 19 queries executed in 0.103 seconds.